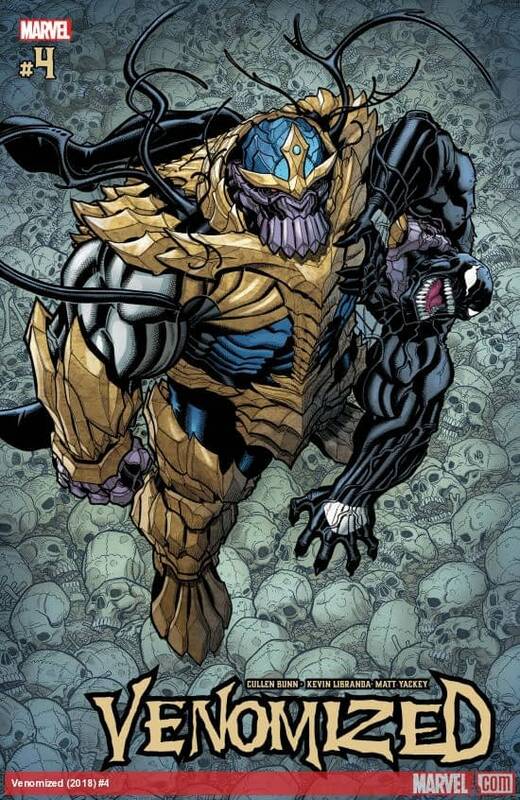 The battle rages between Earth’s VENOMIZED defenders and the POISON invaders, bent on consuming all symbiotes – and life itself – in our universe! VENOM and Earth’s heroes gamble on a risky counterattack to end things…for better or worse! The issue kicks off IN SPAAAAAACE, where bad guys Poison Thanos, Poison Doctor Doom, Poison Jean Grey, and Poison Carnage are talking to ghosts. Ghost Death tells Thanos to attack Earth and bring Kid Kaiju back. Ghost Doctor Doom’s mom tells Poison Doom to stay aboard the ship, as the heroes are probably already on their way there. Ghost Professor X tells Poison Jean to stay behind as well. Carnage doesn’t have a ghost telling him what to do, so he’s just gonna stand around and look like a badass. Jean psychically calls out to Scott. Back on Earth, heroes including Captain America, Kid Kaiju, and Venomized Hercules, Ms. Marvel, Nova, and Falcon strategize on stopping the Poison invasion. Meanwhile, at Alchemax, Cyclops tells Venom, Agent Anti-Venom, Moon Girl, and Doctor Steven that he knows where Jean is and they have to go save her. Venom tries to explain that Jean is dead and it’s a trap, but even time-displaced teenage Cyclops knows that no Jean Grey is ever truly dead in an X-Men comic. Right on cue, Agent Anti-Venom, having a crisis of conscience, worries that the people might still be alive somewhere inside those Poisons and maybe they can be saved. Maybe there’s hope! Venom says they’re running out of time, as illustrated by the massive battle taking place between Poisons and heroes (some of whom are Venomized) right outside the building. Venom tells Cyclops that his girlfriend sold him out, but Cyclops still doesn’t believe it. Venom, Anti-Venom, Moon Girl, and Cyclops head downstairs to jump into the next big two-page battle spread, while, outside, Kitty Pryde and several Venomized X-Men including Magik, Nightcrawler, and Jimmy Hudson try to keep the Venomized Xavier School students from being turned into Poisons (unsuccessfully, in the case of Eye-Boy). Venomized Jimmy Hudson, son of Wolverine from the Ultimate Universe, battles Venomized Carnage, which would probably have sold a billion copies on a variant cover in the ’90s. Unfortunately, Carnage makes quick work of him, and now Jimmy is a Poison Wolverine (which also would have been really hot in the ’90s). 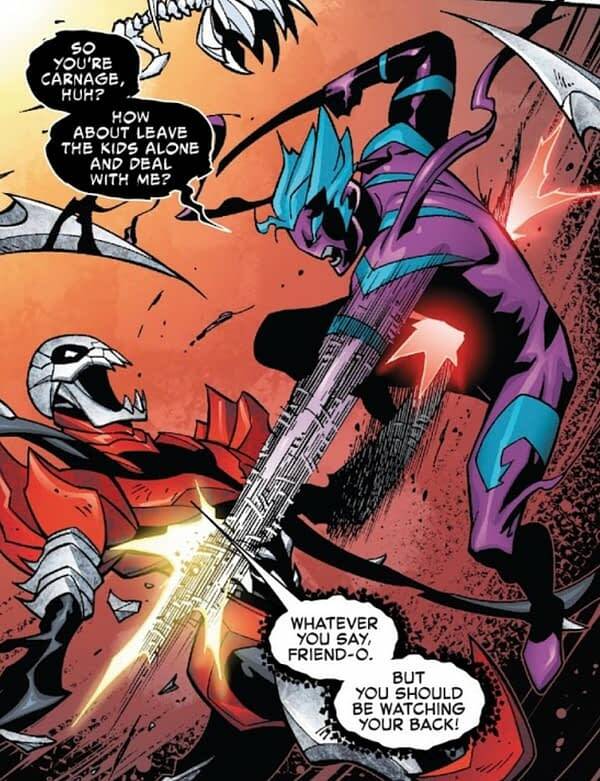 Magneto apologizes for failing to protect Jimmy, but he really should be used to this sort of thing by now. Doug Ramsey died on your watch, Magneto! It looks like Devil Dinosaur is next, but he’s saved as Captain America, Kid Kaiju, and the Venomized Avengers arrive on the scene to save the day. 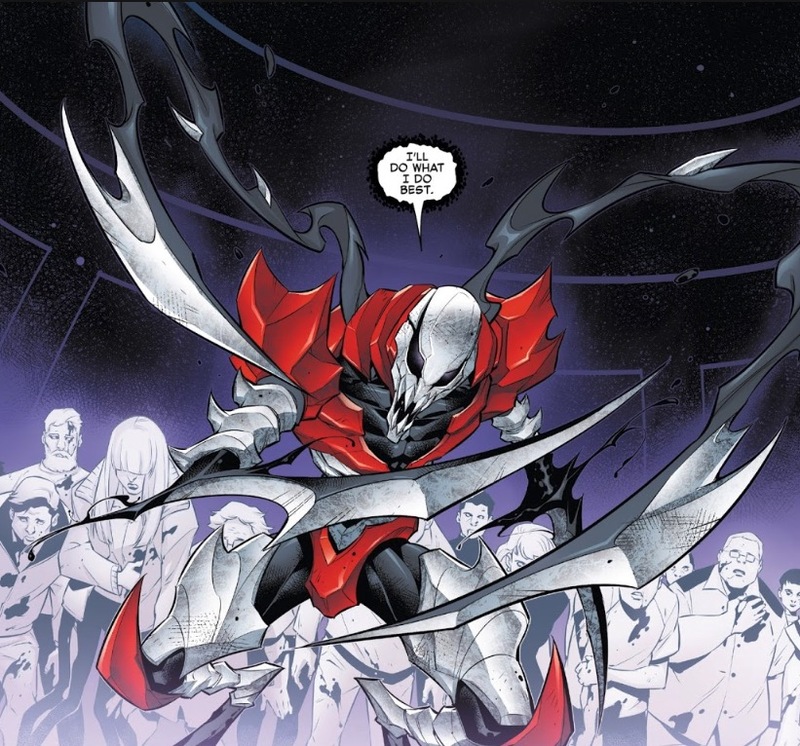 The Venomized X-Men Blue now get into a bit fight scene against Carnage and the Poisons, and we’re beginning to think this whole entire event was planned as nothing but a series of splash page photo ops for various heroes wearing the latest symbiote fashions with as little plot as possible thrown in to get from one to the next. Kid Kaiju uses his monster Pokémon powers to help turn the tide as Cyclops and his crew arrive on the scene. The heroes all agree to head to go to space and attack the venoms (or save Jean, in Cyclops’s case). But first, Kid Kaiju teleports Moon Girl away because child labor laws are very clear about the amount of time kids can spend in a crossover event. Cap, Kid Kaiju, Venomized Ms. Marvel, Anti-Venom, Jessica Jones, Luke Cage, Iron Fist, and Venomized Hercules hop in a quinjet while the time-displaced X-Men, Bloodstorm, Venom, and Daredevil for some reason hop into Danger (the sentient AI that was once the X-Men’s Danger Room, and is now their Blackbird jet plane), and it’s important to know who was on which plane because a moment later Poison Thanos knocks the quinjet out of the sky. So Cap’s team will be fighting Poison Thanos and Poison Carnage on Earth while the X-Men and Friends go to space to fight Poison Doom and Poison Jean. Got it. On Earth, Thanos knocks the Avengers around a bit until Kid Kaiju conjures up his monsters, setting the stage for the big showdown next issue. Look, it’s not that we’re not enjoying ourselves, but this crossover is exhausting. Will it ever end? More importantly, will it have the guts to leave lasting repercussions from all these heroes being turned into Venoms or Poisons, or will everyone be changed back to normal after it’s over? We’ll find out next issue, true believers!